Len Lye Centre. Photo: Patrick Reynolds. Courtesy Patterson Associates. The successful coalescence of artistic vision, civic initiative, political support, multi-decade determination and architectural clarity is a rare occurrence. 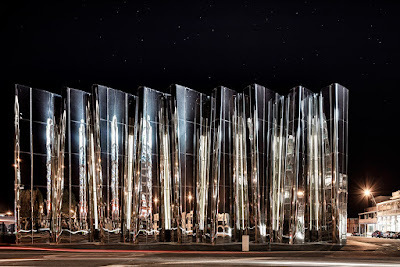 On 25 July 2015 we saw just this when the spirited regional city of New Plymouth on the feisty west coast of New Zealand finally welcomed into its fold, in full force, the breath-taking Len Lye Centre. This astonishing building, designed by Patterson Associates, is an expansion of the Govett-Brewster Art Gallery. It is an even more astonishing achievement given the toughness of the journey. 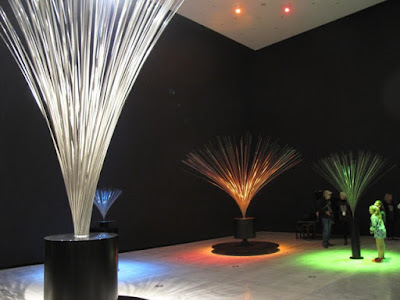 Its sheer existence is testimony to the near 40-year dream initiated by pioneering filmmaker and kinetic artist Len Lye (1901–1980) and sustained by others to create a home for the artist’s work and ideas. 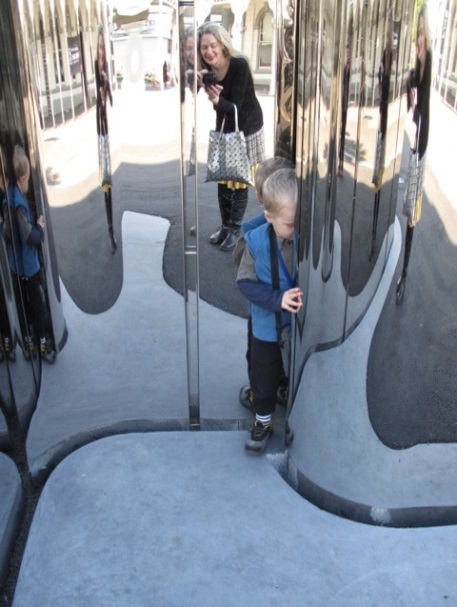 In 1964 Len Lye said, ‘Great architecture goes fifty-fifty with great art.’ This project is a remarkable achievement for art and architecture in this country. Photo: Patrick Reynolds. Courtesy Patterson Associates. Artist’s impression, Patterson Associates. Image: Patterson Associates. 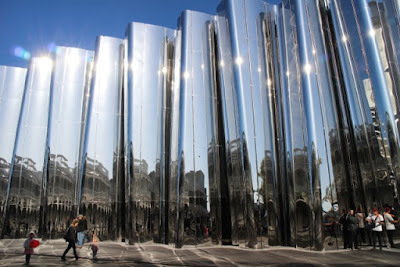 Len Lye Centre. After seven years working on this ambitious project in Taranaki in my role as director of the Govett-Brewster (2006–2013), it was thrilling to finally experience the Len Lye Centre. Its physicality delivered exactly the experience that lead architect Andrew Patterson described it would nearly five years ago. The polished stainless steel exterior is dazzling, of course, and mighty Instagram/selfie friendly. Every view is seductive and every photo a knockout. Yet the building is much more than its reflective exterior; it is inversely kinetic in its establishment of interplay between exterior and interior through the 14-metre high glass apertures embedded in the folds. These lens-like windows reflect and refract light against the mirrored stainless steel, forming a reading of the outside world inside, and the inside world outside which (to quote Tim Gruchy) ‘bends reality’. Patterson’s idea is that by moving around and through the spaces, people activate the kineticism of the building itself. 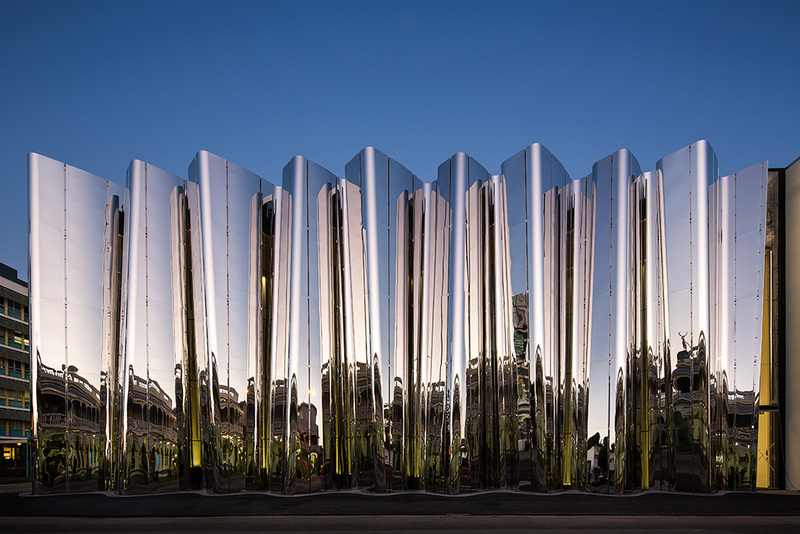 Len Lye Centre’s stainless steel exterior on Queen Street. Photo: the author. 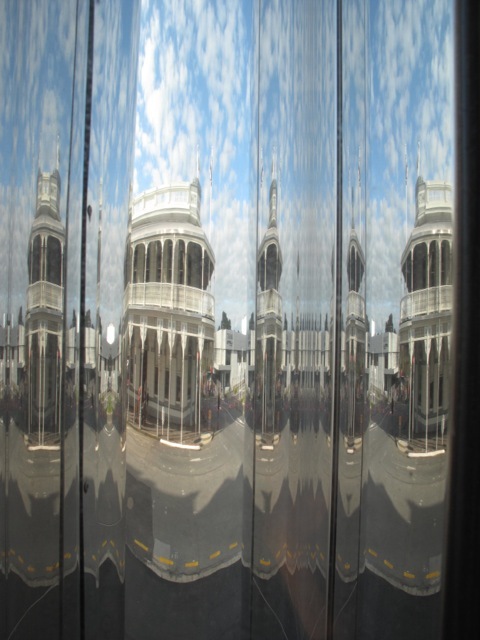 Inside the Len Lye Centre foyer, looking towards Devon Street with Queen Street reflected through an aperture. Photo: the author. The exterior is also remarkably subtle, sensuous and responsive to the surrounding environment whether it be the infamous colonial White Hart Hotel from 1886 on Queen Street, or the gridded Atkinson House from 1950 on Devon Street. 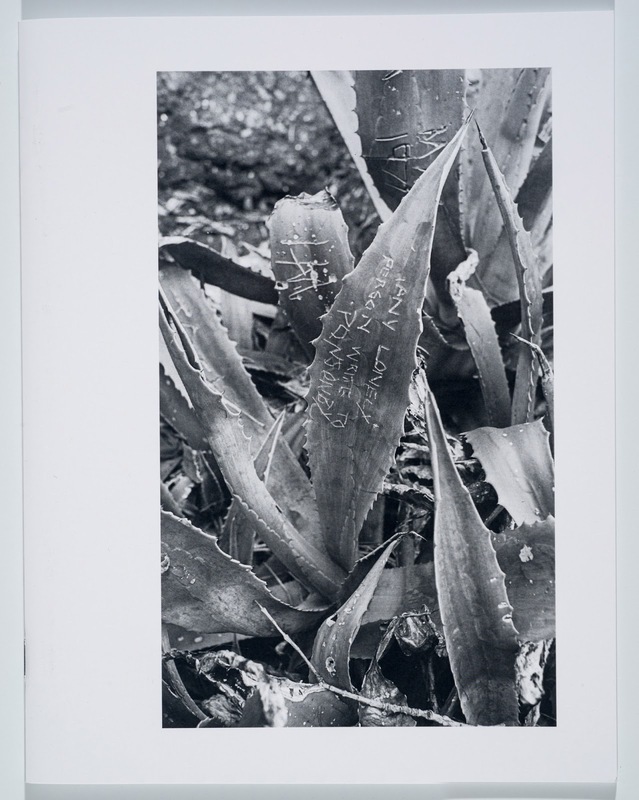 Both are embraced and become part of the visual play – a contrapuntal array that bounces renovated colonial delicacy, civic mid-century modernism and the poetics of 21st-century architecture’s digitally inflected practice. Patterson explained his choice of stainless steel and concrete as local materials – applying the high-calibre engineering and industrial manufacturing in New Plymouth and ensuring that over 70 per cent of the contractors were from Taranaki. 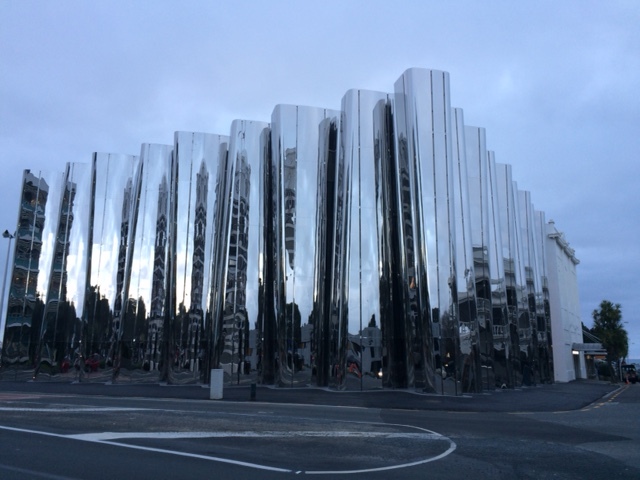 Len Lye Centre. Photo: Sam Hartnett. Courtesy Patterson Associates. The building struck me on first viewing as deliriously elegant. Rem Koolhaas crafted his persuasive book Delirious New York in 1978. I remember poring over Luit Bieringa’s copy during the early days of the commissioning process and thinking about the notion of audaciousness in relation to a city’s dreaming about itself. Koolhaas talks about ‘theories, tactics and dissimulations to establish the desires’ and the symbiotic relationships amongst architecture, new technologies and lifestyle. New Plymouth/New York . . . I often thought about making an exhibition that played on the tenuous connection formed between these places by the shared ‘new’ of their names, but the connection has perhaps now been writ large in the singularity of the building; its valiant existence and its particular relationship to the city’s psyche. 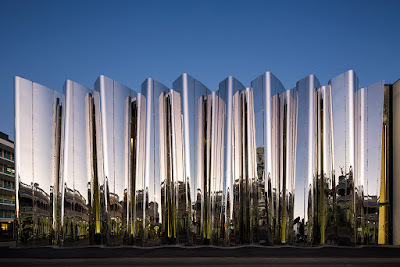 Len Lye Centre. Photo: the author. 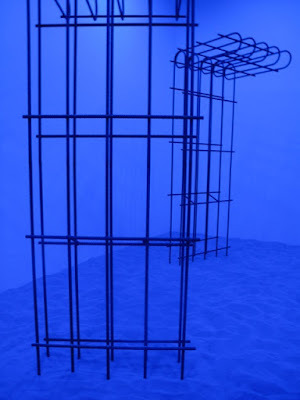 Gilles Deleuze has written about thought itself as a kind of fold – the folding inside of what he calls the ‘forces of the outside’.1 The idea also acts a critique of subjectivity when notions of exteriority and interiority (appearance and essence, or surface and depth) are blurred as outside and inside merge. This connects to ideas about our bodies and being if one considers human skin and its functioning importance as our largest organ and, of course, the folding together of time and of memory. Deleuze talks about ‘possible worlds’ that simultaneously exist. For him, the universe, like origami, is a process of folding and unfolding the outside. The Len Lye Centre project folds in a specific history that interleaves various times and places: an artist, a public museum, a foundation, a body of work that is concerned with the dynamism/rhythm of bodily experience, a city (and other cities), and a group of supportive individuals. The building succeeds in folding the exterior into the interior in a process of simultaneously looking outwards into the world and focusing inwards on gestures of art-making; a process of making not unfamiliar to Len Lye’s own methodology of experimentation. Concrete on concrete, foyer detail. Photo: the author. Todd Energy Foyer, Len Lye Centre. Photo: Patrick Reynolds. Courtesy Patterson Associates. 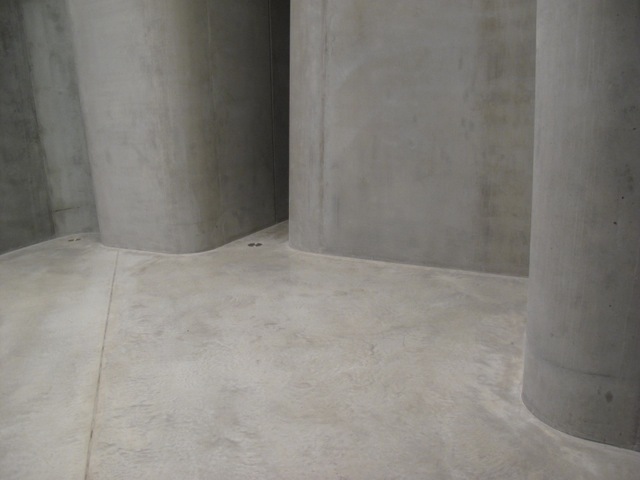 To experience the internal spaces for the first time was fascinating – the modest entrance through Govett-Brewster to the dual-purposed building, turning left into the cathedral-like rising concrete colonnade of the foyer, and the precise attention given to the detailed handling of the ‘soft’ grey concrete. Patterson Associates’ Project Director Andrew Mitchell was particularly attentive to these details. The watery concrete edges where the stainless steel meets the city’s pavement outside and the touch-points where the climbing concrete floor and curved walls meet inside in the foyer are particularly refined, bringing a minimal and sensitive use of materials that can be seen elsewhere in the work of Patterson Associates. Rendering of the Len Lye Centre and Govett-Brewster. Image: Patterson Associates. 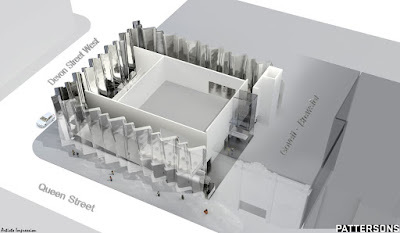 Transversal Section of Len Lye Centre. Image: Patterson Associates. The building is conceived of as an anthropomorphic temple but in the Polynesian tradition of a wharenui (meeting house) with an identity in itself. This perception enables the art placed in it to manifest in the same way. ... The resulting combined structure [with the Govett-Brewster Art Gallery] can be seen as an antipodean or New World Temple: rather than being designed using traditional aesthetic approaches such as ‘neo classic’ or proportioning, its design has been generated by using a Systems or Pattern Methodology. This means that its design process worked in a holistic way using patterns in the ecology of the project’s environment. This environment included locational, cultural and heritage attributes, as well as the physical. 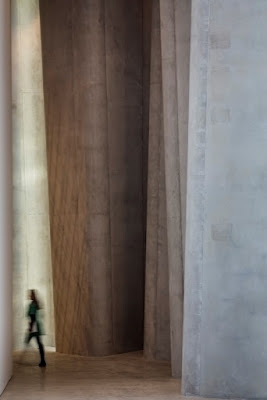 Once inside, the design uses the colonnade to create a sort of theatre curtain but in this contemporary temple the curtain uses three asymmetric ramped sides to form a type of pronaos (which the Centre’s Large Works Gallery unveils). The procession of the colonnade morphs into a sort of linear or asymmetric portico to announce the Main Gallery as a type of primitive hall or megaron. 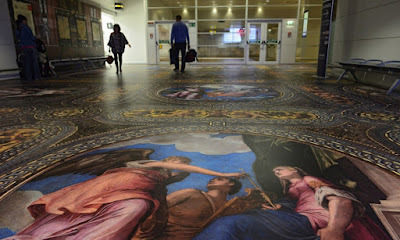 Common to nearly all cultures, this space is where the divinity now houses the art. Below this is a womb-like education space set into the pit of the resulting form. Each of the 14-metre high monolithic repeating columns surrounding it are constructed of a single precast piece of concrete. It might be an iconic octastyle but with nine columns or a giant crinkle cut chip pattern. The columns reject formal language elements to distort the space, all that remains is the reflection of light. 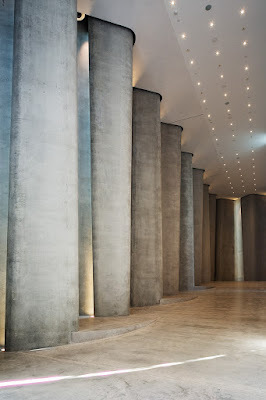 An adyton (the most hidden sacred and private part of a temple, usually found furthest from the entrance) houses the Len Lye Archive while a type of opisthodomos looks back democratically to the people entering below as the building’s treasury. And all this is in dialogue with the old Govett-Brewster building in the converted cinema, whose existing tiered galleries now form the Grand Stair, here, as a kind of cinematographic exit. Central to the brief we wrote when I was Govett-Brewster director was that the building would be the ideal place in the world to experience Len Lye’s work – both his direct films and kinetic sculptural work, as well as photograms, drawings, textiles, rare books, poems, paintings and the Archive. 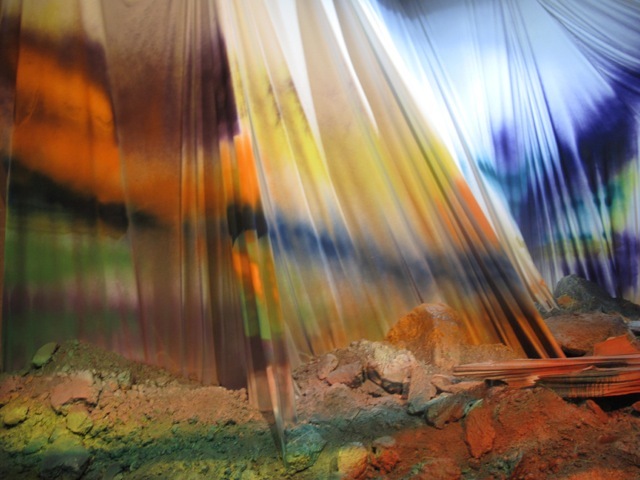 Throughout the process Patterson would travel from Auckland for exhibition openings and watch carefully as we worked with artists and entirely reconfigured the Govett-Brewster spaces for exhibitions such as Stealing the Senses (2011) and Sub-Tropical Heat: New Art from South Asia (2012). What Patterson and I also discussed at length from the outset was the fundamental and necessary relationship between the Govett-Brewster and the Len Lye Centre. 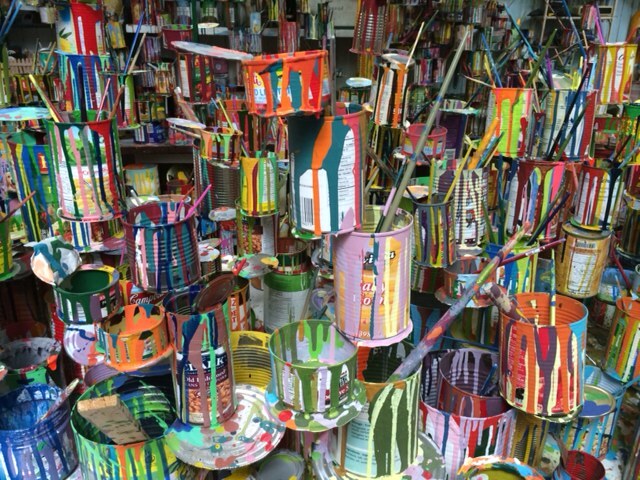 There was an urgency to create in New Zealand a robust, adaptable space for contemporary art. Govett-Brewster is the reason that Len Lye’s collection is in New Zealand, and since it burst forth onto the world in 1970 with the young Leon Narbey’s immersive installation, Real Time, Govett-Brewster has always been dedicated to the ‘now’ and to an uncompromising provocation. 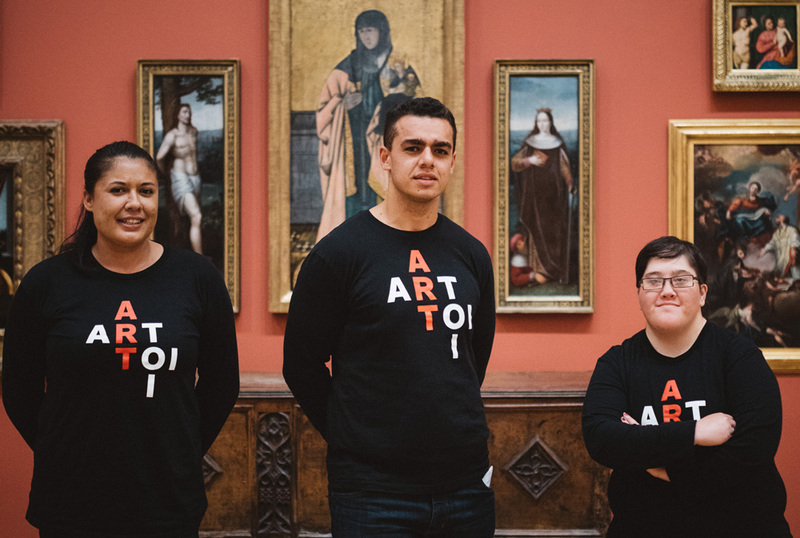 This is an important project for New Zealand art that builds on the strength and determination of one of the country’s most influential art organisations and the country’s only dedicated contemporary art museum. Importantly, this project also included a complete refurbishment of the Govett-Brewster to earthquake strengthen and to update HVAC and H&S (this involved a process of working with Billy Apple to increase the height of the balustrades in his architectural intervention, Altered Staircase: The Given as an Art-Political Statement, 1980, the only work acquired by an institution from Apple’s Alteration series). Large Works Gallery, Len Lye Centre. Photo: the author. 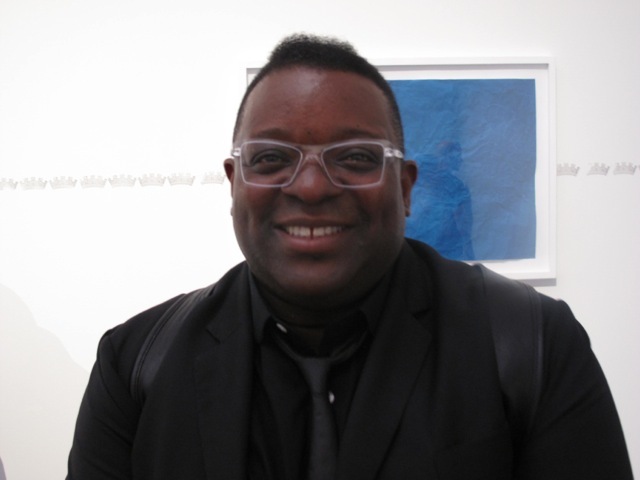 Immediately after his firm’s appointment, Andrew Patterson began an extensive process of interviewing individuals involved in the project. He developed three markers of quality assurance: that the building was the best place in the world to experience Len Lye’s art and ideas; that the building would be a cultural attractor for New Plymouth, and that the building reflected the close symbiotic relationship with the Govett-Brewster. 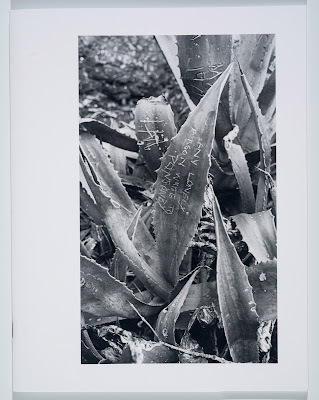 On delivery, Patterson also outlined his instruction manual: the building must be washed annually as one would a glass building; the spaces remain interchangeable between Len Lye associated programming and contemporary art; and the director has the capacity for vision and leadership. 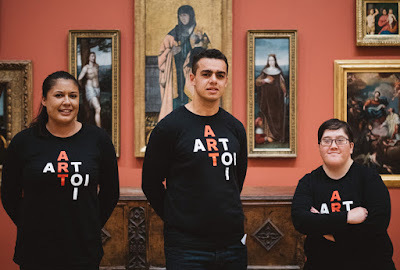 Over the opening weekend there were 8500 visitors – that’s over 10 per cent of the population of New Plymouth – alongside a large swathe New Zealand’s art community, four government ministers, the mayor, a host of local councillors and, importantly, a strong Māori presence. Len Lye Centre Cinema. Photo: Sam Hartnett. Courtesy Patterson Associates. A highlight during the opening was being present in the beautifully appointed 62-seat cinema for the inaugural screenings with others who had contributed to the lively passage of events: John Matthews (long-time Chair of the Len Lye Foundation), Wystan Curnow and Roger Horrocks (Len Lye Foundation Trustees), filmmaker Shirley Horrocks, Tim Gruchy who advised on the cinema, Paul Brobbel (current Len Lye curator), Simon Rees (current director) and artist and educator Ray Thorburn, who played a key role in the early 1970s introductions between Len Lye and the Govett-Brewster. The programme was compelling: Lye’s first film, Tusalava (1929) followed by the remastered film work from Govett-Brewster’s first exhibition, Leon Narbey’s A Film of Real Time (1970) introduced by artist Paul Hartigan. 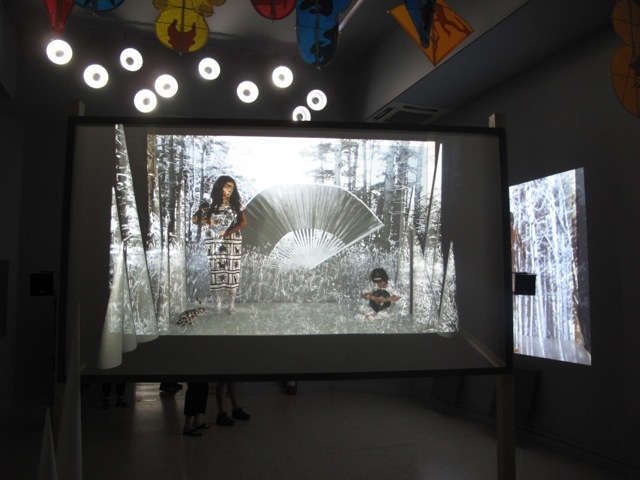 The nine-minute Tusalava involved more than 9500 individual drawings in stop-frame animation on 16 mm. The film, begun in Sydney, was influenced by modernism and genetic science, and by Māori, Aboriginal and Sāmoan art. Its original Jack Ellitt soundtrack has been lost for decades, but the film was accompanied by Eugene Goossens’ (1893–1962) Rhythmic Dance for Two Pianos op. 30 from 1920 played live by the Auckland Philharmonic Orchestra. Again, it was remarkable to experience the cinema as Patterson Associates had envisaged it and as had been discussed at length. 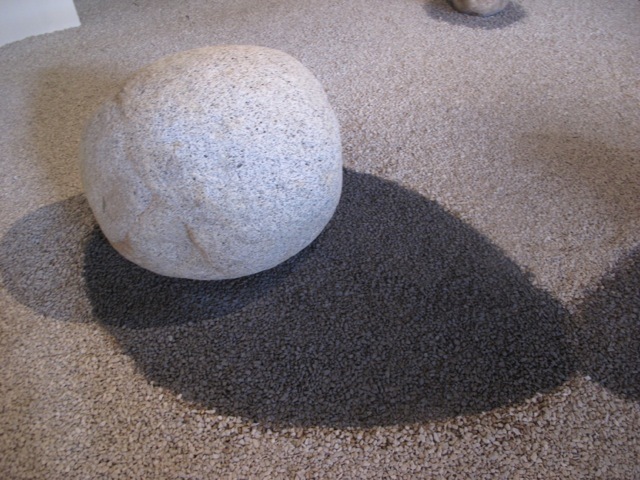 (See my earlier blog about Tusalava as part of the Len Lye: Agiagiā exhibition at Mangere Art Centre in 2014). 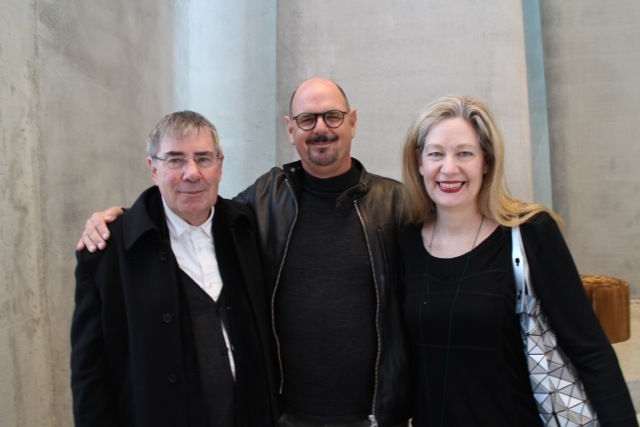 Wystan Curnow (Len Lye Foundation Trustee), Andrew Patterson and the author. Photo: Tim Gruchy. The passage of events that led to the Centre spans four decades and is reasonably well known but it’s worth drawing a summary. After living briefly in Sāmoa and Sydney, the Christchurch-born, Wellington-design-trained Len Lye worked his passage to London in 1926 as a coal trimmer on a steamship. There he completed Tusalava. 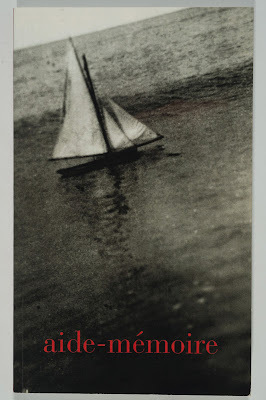 Lye soon joined the modernist Seven and Five Society, exhibited with the Surrealists in 1939, became friends with Dylan Thomas, Robert Greaves and Laura Riding, and started making experimental short films for the General Post Office where he manipulated and painted directly onto celluloid and produced his influential film, A Colour Box in 1935. 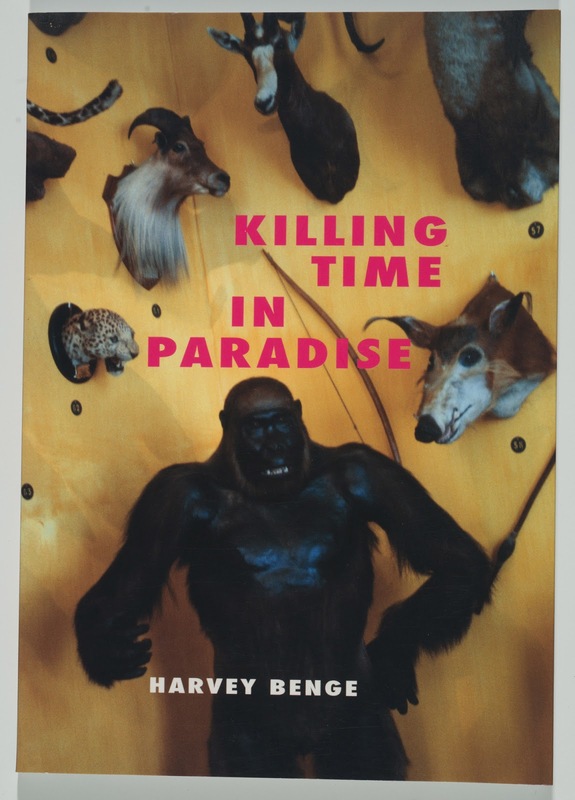 He moved to New York in 1944 to work for the future-focused newsreel magazine, The March of Time. In 1958 he began scratching directly onto black emulsion to make his landmark film Free Radicals, which he completed in 1979. Lye’s veracious curiosity meant his interests swooped from astronomy and poetry to cultural anthropology and new jazz. In New York his passion for the possibilities of rhythm, energy and bodily movement expanded to experimentations with kinetic sculpture. 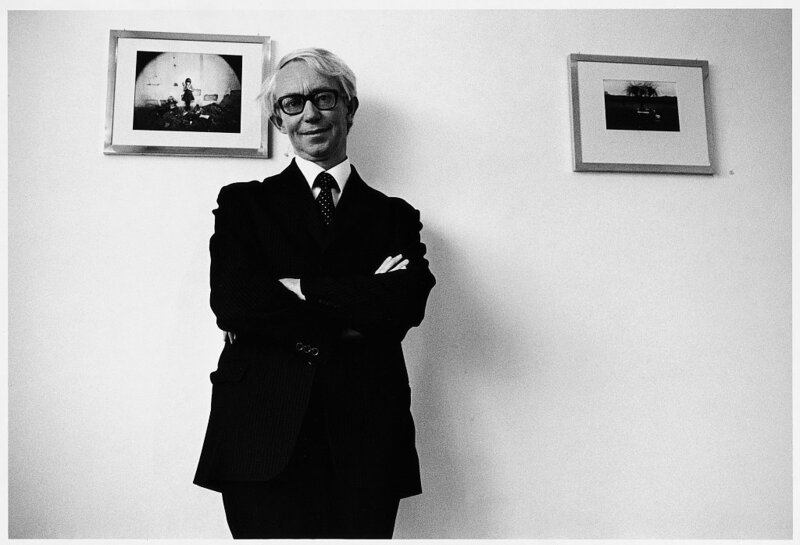 During the 1970s Lye was eager to see a major exhibition of his work in New Zealand and it was John Maynard, the dynamic new director of Govett-Brewster, who recognised the opportunity and embraced the idea. John Matthews, a young engineer living in New Plymouth, was already involved with Govett-Brewster’s formation and connected with Lye in New York. 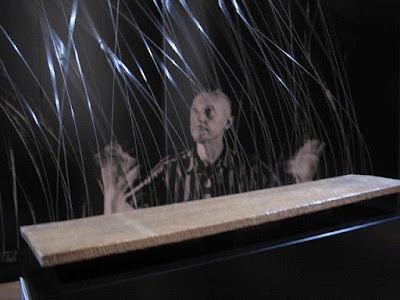 He soon began the process of realising Lye’s electrically powered kinetic projects, working to the large scale the artist had always imagined. Works such as Trilogy and Large Fountain, both 1977, were developed and made in New Plymouth, harnessing the engineering skills of a town dedicated since the 1950s to ‘White Gold’ and ‘Black Gold’. Finally, in 1977, the solo exhibition opened at Govett-Brewster, curated by Maynard. Len passed away in New York in 1980, soon after establishing the Len Lye Foundation. The Foundation began the process of relocating his Collection and Archive to the Govett-Brewster, gifted by Len Lye to the people of New Zealand in 1980. The non-film works are housed at Govett-Brewster and the films at Ngā Taonga Sound and Vision – New Zealand Archive of Film, TV and Sound. Matthews, artist Max Gimblett, Roger Horrocks and Lye’s widow Anne were all involved. Lye had imagined what he called a ‘temple’ to his work and the idea lingered with the Foundation. 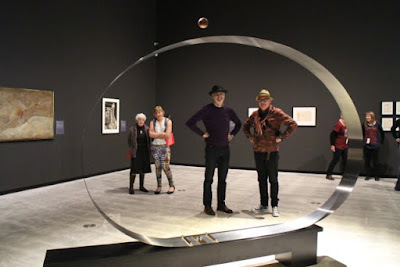 The Brothers Reynolds in the Main Gallery, Len Lye Centre. Photo: the author. Greg Burke, during his tenure as director, kicked things along with the establishment of a Len Lye Curator position and dedicated resource to the Collection and Archive. His appointment of Tyler Cann, a young art history post-graduate from the States proved pitch perfect to the research and curatorial needs. A Len Lye exhibition had already been presented every summer since 1977; however, it wasn’t until Cann’s appointment that the ambitions and possibilities started to be unearthed and grow. I arrived in 2006 to a dual brief: leading the Govett-Brewster and realising the Len Lye Centre project. Barbara McKerrow drove the project within New Plymouth District Council, later joined by Cathy Thurston with Jim Wilson and Gaye Batty on the project management side. Councillors came and went and certain politicians, such as the impressive Lance Girling-Butcher, Lyn Bublitz and Maree Pearce embraced and fought hard to see the positive aspects of this project flourish in their city. Various approaches to government took place but we soon realised that no traction would occur until an architectural vision articulated the ambition. An extraordinarily rigorous process ensured and after more than a dozen interviews undertaken in architectural studios around the country, four architects were shortlisted. 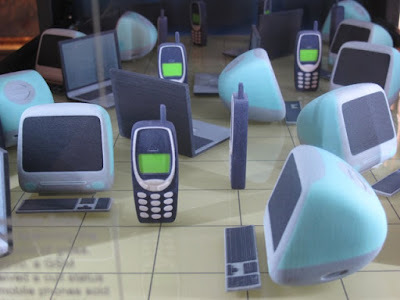 The questions we asked were not about initial designs, but rather about the firms’ approaches to the process and their capacity for quality assurance. Architect Sir Miles Warren was a key player in this interviewing process, alongside Matthews, and I remember Sir Miles’ razor-sharp declaration that Patterson Associates were the only choice. Len Lye Centre from Queen Street. Photo: the author. 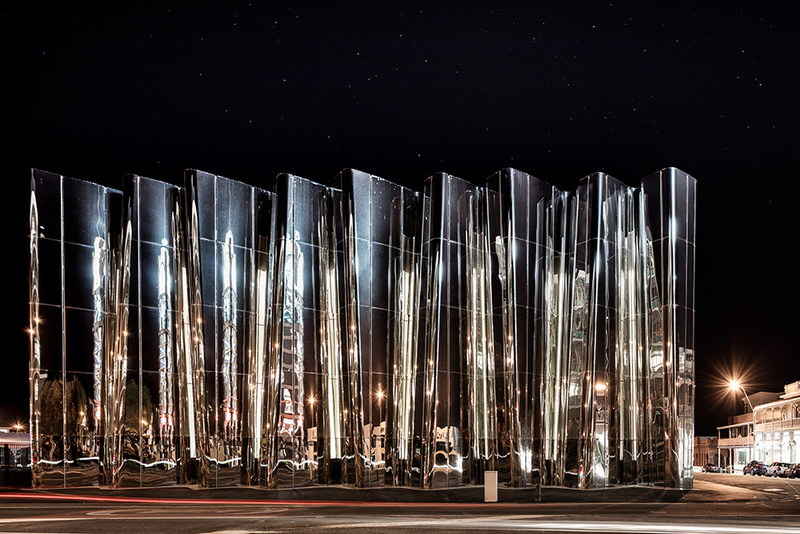 The Len Lye Centre – with a core budget of a mere $11.5 million – was entirely funded externally to New Plymouth rates. The financial support came first from the TSB Community Trust, then after Patterson Associates’ design, $4 million from Todd Energy, $4 million from the Regional Museums Policy for Capital Construction Projects from central government, $500,000 from Lotteries for the roof, a second commitment from TSB Trust, and the rest from private philanthropy including ‘selling’ the stainless steel panels at $10,000 each. Let’s just say, the political climate was not easy and the project involved relentless determination at so many moments by so many people, working on so many levels. Each year we had to defend the project’s continuation and each year we secured the numbers – just! Each year I fought for free entry to the Govett-Brewster and each year we had the numbers – barely! I was determined not to leave the project before its certainty was secure; that meant ensuring infrastructural, architectural, financial and political support. When the mauri stone was laid with Govett-Brewster kaumatua Whareoka Wano and the Governor-General, His Excellency Lieutenant General The Right Hon Sir Jerry Mateparae, the project became unstoppable. 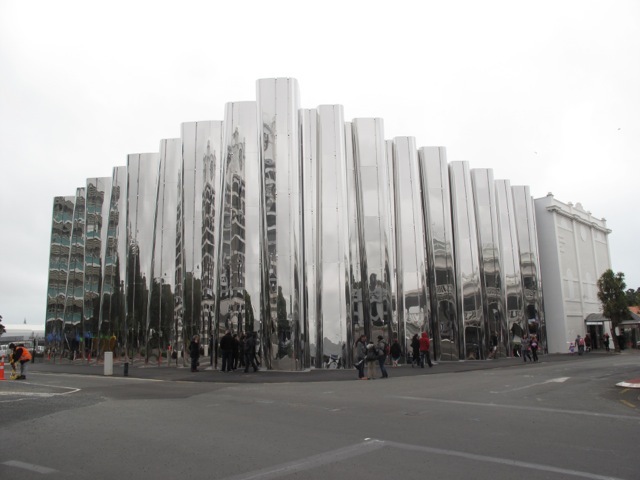 Len Lye Centre from Devon St. Photo: the author. During this six-year period an enjoyable aspect was developing museological partnerships on the international stage. 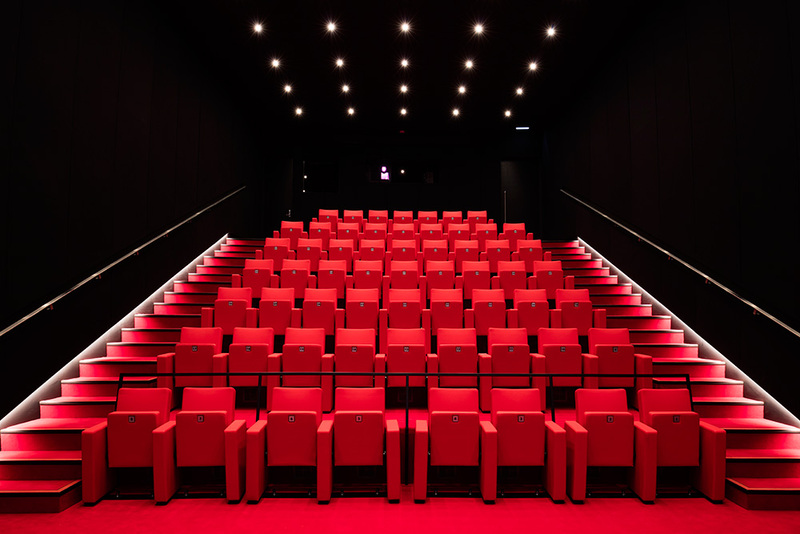 We worked with the Len Lye Foundation, the then named New Zealand Film Archive and the Museum of Modern Art, New York on the restoration of films. We worked with the Whitney Museum of American Art on the restoration of their kinetic sculpture Fountain, 1959; and we also reconnected with Len’s family. We developed two key exhibitions, Len Lye at ACMI (Australian Centre of Moving Image) in Melbourne in 2009 working with Alessio Cavallaro, which was accompanied by a significant book that we co-produced, and a zingy exhibition at IKON Gallery in Birmingham in 2010 working with Jonathan Watkins in what the Guardian rated as one of the 10 best shows of the season. Scholars came from over the world to research the Archives and we employed Paul Brobbel as an archivist. We worked with the New Zealand Film Archive and Park Road Post to restore Len’s films to build on a multi-year research project funded by the Stout Trust led by Evan Webb, director of the Len Lye Foundation and film researcher Sarah Davy to view all the films of Len Lye in collections and archives internationally, establish the best prints and unearth undiscovered film works. Forgotten footage was found after time spent in MOMA’s Celeste Bartos Film Preservation Center, a bunker in Pennsylvania. We facilitated the commissioning, with the Len Lye Foundation, of the reconstruction of works such as Firebush for Five Fountains and a Firebush at Govett-Brewster in 2007, Convolution for Revolutions – Forms that Turn, the Biennale of Sydney 2008 curated by Carolyn Christov-Bakargiev, and Zebra for the AMCI exhibition in 2009. Evan Webb, Stuart Robb and John Matthews were highly instrumental in this work based on thorough research drawn from the Archives. Many of these kinetic works had only ever existed as concepts and experimental prototypes. What we did through this process was acknowledge Lye’s singular contribution on the international stage to experimental filmmaking and kinetic sculpture and ensure the legacy of his practice building on the strong connections he had made during his lifetime with museums and art centres across the globe. Len Lye was a modernist and a radical experimenter, he grew up with a century as it shifted and mutated, and in 1980, at the point of post-modernity, he passed away and the journey of this project truly began. 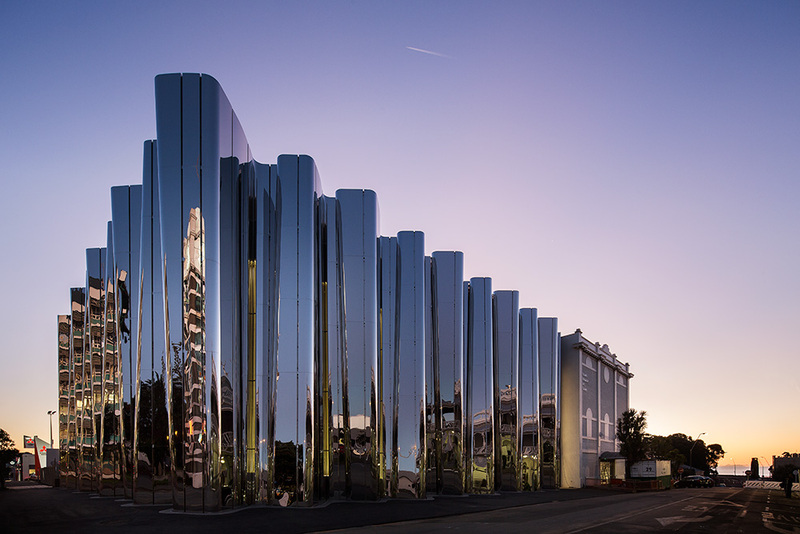 Yet, rather than being contained by last-century thinking, the Len Lye Centre project challenges modernism’s hold on architecture and art and is potent in its timeliness and its capacity for the possibilities of tomorrow. Todd Energy Foyer, Len Lye Centre: Photo: Patrick Reynolds. Courtesy: Patterson Associates. 1 Gilles Deleuze, A Thousand Plateaus, Brian Massumi (trans), Athlone Press, London, 1988; Gilles Deleuze, The Fold: Leibniz and the Baroque, Tom Conley (trans), University of Minnesota Press, Minneapolis, 1993. 2 All quotes from Andrew Patterson, 30 June 2015. 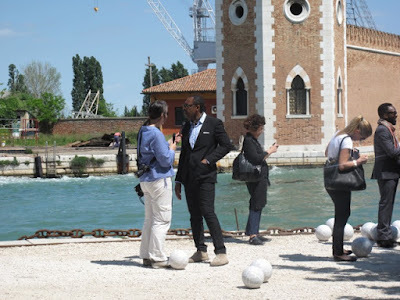 Just days after the opening of the 56th Biennale biting criticisms of curator Okwui Enwezor’s Central Pavilion were already appearing. It seems that the oldest international showplace for contemporary art is also the most feverishly pitched and vulnerable to judgement. 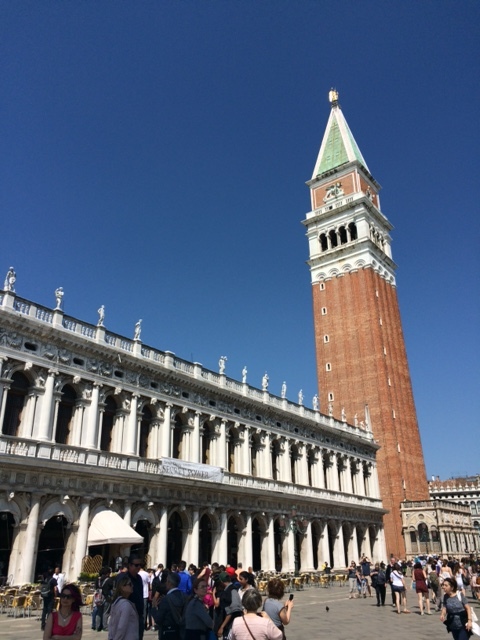 The Biennale, established by a decree from the mayor of the city, opened for the first time in 1895 to great public acclaim and a whopping 224,000 visitors. Today it seems the curator never has enough time. 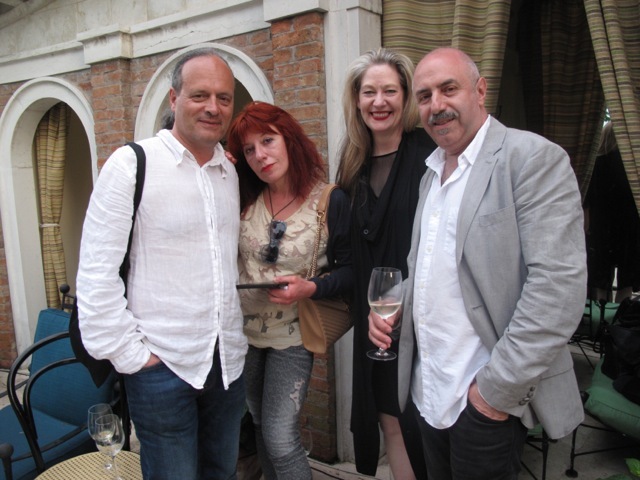 They are expected to surprise, delight and challenge with a wealth of ‘fresh’ artists and, given the Biennale’s importance in the art calendar, are seemingly also charged with recasting the entire conception of a biennale. The curator must miraculously conjure all of this in the floating, historical, utterly charming and mostly non-climate-controlled environment that is Venice. 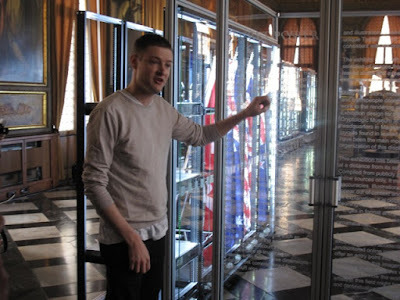 It should be said at the outset that the New Zealand Pavilion with Simon Denny’s impressive work SECRET POWER forged a notable presence amid the sea of art at this year’s Venice Biennale . . . more on that later. Enwezor’s sweeping and layered exhibition achieves in showcasing many artists unfamiliar to the Biennale’s primarily European audiences and in providing a central focus to politically strident works that engage with the trauma and hypocrisies of our time. This, along with the intentional density of the layout, may prove uncomfortable for some. 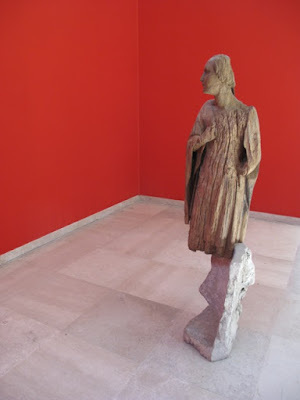 I found the Central Pavilion in the Giardini attentively curated; its works were positioned with considered enterprise, such as the placement of three wonderful painters in concert: Ellen Gallagher, Huma Bhabha and Emily Kame Kngwarreye. The Hans Haacke room of sympathetic works, the heady intensity of the paper-strewn Thomas Hirschhorn space, the haunting Marlene Dumas room of skull watercolours, Isa Genzken’s lively unrealised models, John Akomfrah’s video meditation on the sea, and Wangechi Mutu’s metaphysical video and sculptural work all provided rewarding foci. 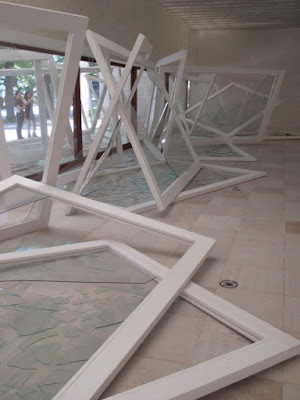 As an extension of the Pavilion, Enwezor located a series of arresting sculptures by Raqs Media Collective throughout the main thoroughfare at the Giardini that deconstructed the idea of the monument. Certain artists were allocated a major presence in the Central Pavilion including the intriguing Fabio Mauri, whose work provided an impactful portal to the Giardini exhibition. 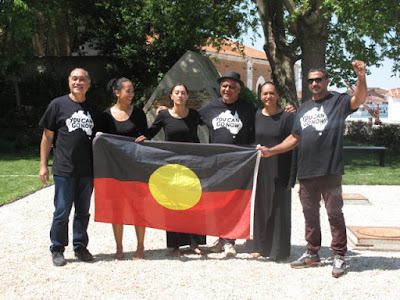 Artists such as Australian indigenous painter Daniel Boyd, photographer and media artist Chris Marker, painter Huma Bhabha and time-based artist Samson Kambalu, among others, were present in both the Giardini and Arsenale venues – all are exceptional artists. 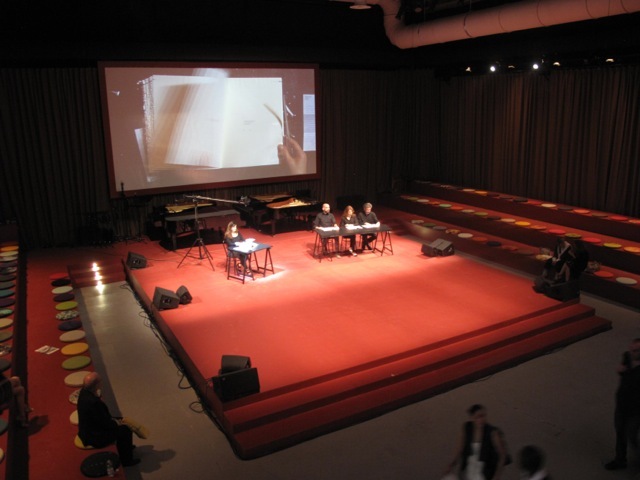 The ARENA, a large blood-red performance space, designed by Ghanaian/British architect David Adjaye, held central sway in the heart of the Giardini’s Central Pavilion space with Isaac Julien’s Das Kapital Oratorio and Olaf Nicolai’s backpack audio work among a dozen or so performative projects that require time and scrutiny. It has been said that the scarcest resource of the 21st-century is human attention. The opening of Venice Biennale in its striding, panting, agenda-driven glory is testament to that observation. Enwezor’s thronging array of works over two sites also reminds us of our own role in real-time editing as we navigate through the swarm of knowledge on offer and the urgent questions of our time. 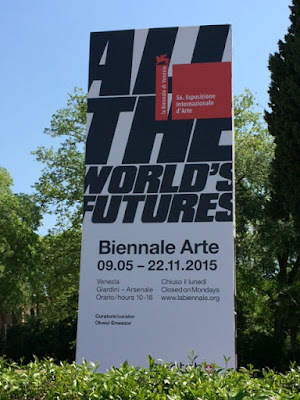 Yet the Venice Biennale is much more than the Central Pavilion. The country pavilions are driven by a different momentum – nations jostle to present timely (not always new) work in unexpected ways; to be uncompromising in selection, brave in reach and, importantly, to be noticed (which is known as achieving ‘cut-through’ in the profession). 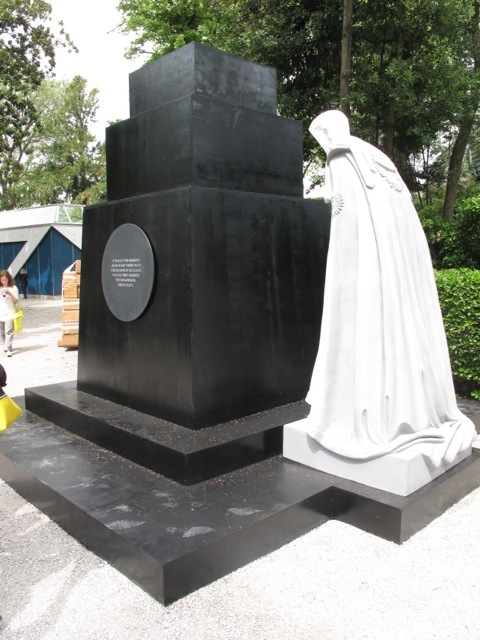 One thing I found interesting at this year’s Biennale was the number of country pavilions that riffed off the architectural forms of the pavilions themselves. 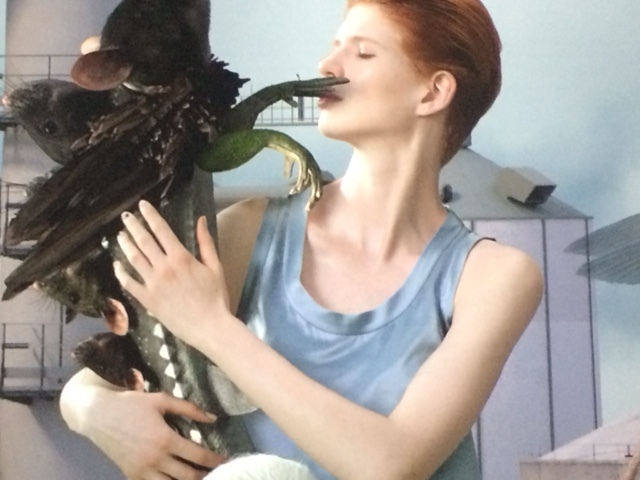 This is perhaps a reflection on the site-specific nature of much of today’s art practice. It’s interesting how the Architecture Biennale is full of art projects and the Art Biennale is crammed with architectural interventions. Perhaps one feeds into the other in this potent site which is constantly at the service of the still hale and hearty international ‘national pavilion’ model. 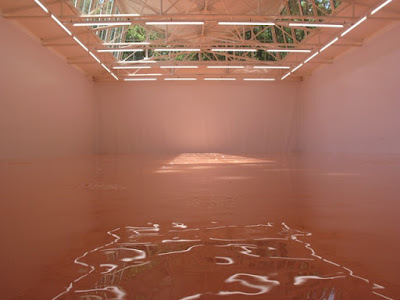 The crowded intensity of Enwezor’s Central Pavilion was counterpoised with often airy and indeed somewhat empty pavilions in which artists play with a lightness of touch and work with light itself as it was allowed to enter. 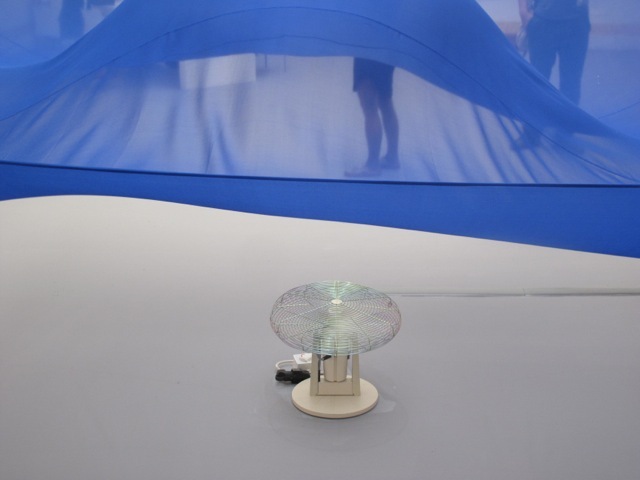 Oversized cylindrical semi-kinetic structures were installed above head height (Szilard Cseke in the Hungarian Pavilion); walls removed (Heimo Zobernig in the Austrian Pavilion) or broken through (André Komatsu in the Brazilian Pavilion); windows replicated and stacked within a soundscape (Camille Norment’s elegant Rapture in the Nordic Pavilion); while other artists located small careful gestures in largely empty spaces (Danh Vo in the Danish Pavilion and the subtle mediations on impossible cities by Marco Maggi in the much talked about Uruguay Pavilion). Interestingly, this aesthetic continues at Punta Della Dogana over the Grand Canal at Salute. 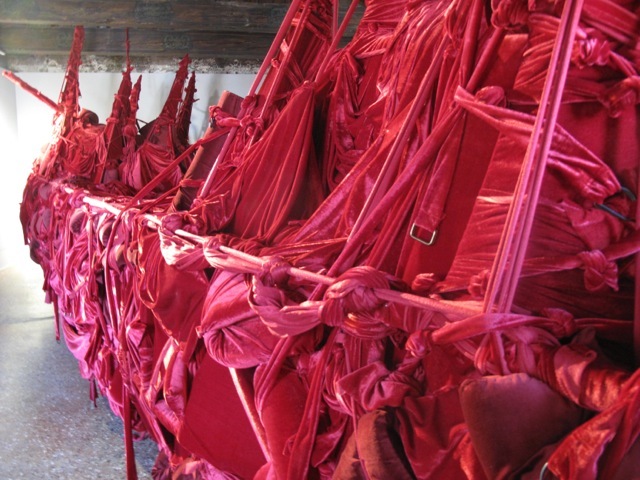 There, Danh Vo has curated Slip of the Tongue from the Pinault Collection, creating a restrained installation of some materially explorative work including modest sculptural contributions from Vo himself. One of the most memorable in this architecturally spacious vein in the Giardini was Pamela Rosenkranz’s seductive and synthetic Swiss Pavilion, Our Product. 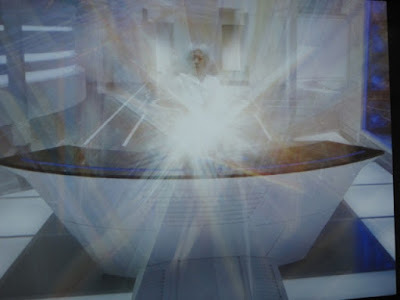 One enters an empty room awash in artificial green light. From there a narrow walkway leads to a luminous fleshy pink-hued space waist high with water reflecting the architectural structures above. For me, this appeared like an ethereal, elemental reversal of the materials in Walter Di Maria’s The New York Earth Room, 1977. In contrast, a small number of pavilions offered intensive sensory immersion: Moon Kyungwon and Jeon Joonho’s futuristic sci-fi projections for the Korean Pavilion, The Ways of Folding & Flying which inverted the building’s exterior membrane into an extended screening site; Chiharu Shiota’s astonishingly beautiful and popular installation, The Key in the Hand for Japan; and BGL’s hyper-excessive accumulative installation for Canada which combines humour and repetition with an extravagant use of ordinary materials. The United States Pavilion deserved its long queues at the Vernissage with a marvellously resolved, inventive and moving series of installations, projections, assemblages and performances. They Come to Us without a Word by the 78-year-old Joan Jonas examines rhythms of ritual and the authority of objects and gestures. 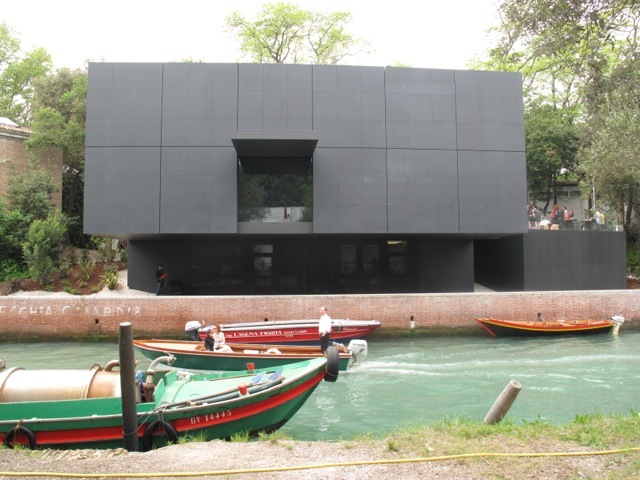 Australia celebrated its new $7.5 million black box in the Giardini (opened by Cate Blanchett and the Minister for the Arts George Brandis), which was designed by respected Melbourne architectural firm DCM and primarily funded from private sources. 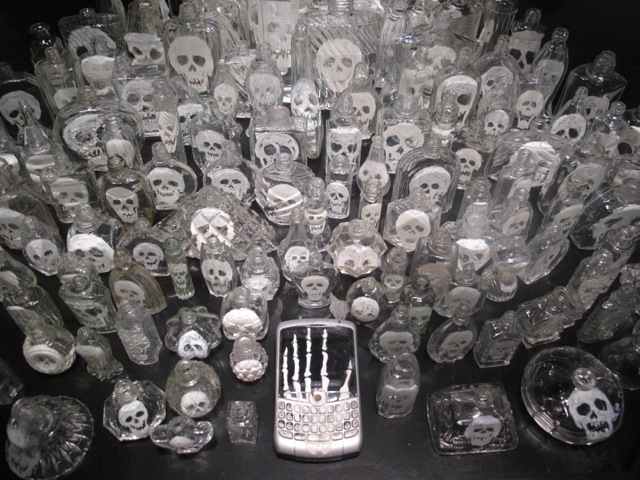 In the new space over 1300 works comprised Fiona Hall’s vast and manifold walk-in cabinet of curiosities, Wrong Way Time in the new space, a project that continued the artist’s intensive investigation of our fragile natural environment and what she calls ‘the madness, badness and sadness’ of today. Just days after this two-fold achievement, the head of the Australia Council, who successfully managed and fundraised for the new pavilion project, was informed by the Arts Minister of an immediate reduction of near $105 million from its annual budget (amounting to around a 50% cut) to be transferred for distribution to the arts from the Minister’s own office . . . interesting times. Over to the Arsenale, the Byzantine-style enclave of former shipyards and armouries, where the long pathway to the left of the Corderie was draped in mammoth, dark-stained hessian coal sacks in a work that addresses supply and demand of raw commodities, exchange and value by Ibrahim Mahama, one of 12 African artists in the Central Pavilion. Enwezor’s Central Pavilion in this site was less carefully articulated and is wrought as a rather disorientating assortment of cubicles that both gave little room for work to breathe and offered a platform for unexpected synergies. That being said and noted by many people during the Vernissage, there are certainly spacious and powerful moments such as Katharina Grosse’s vast painterly dystopian installation Untitled Trumpet; the mercurial Qiu Zhijie’s room of objects of wonder, Chris Ofili’s chapel-like space of painted walls and works (that is a microcosm of his New Museum solo exhibition of 2014) and a superb room containing a suspended canopy of tiny scrolling video portraits by the brilliant Turkish artist Kutlug Ataman accompanied by the late Chris Marker’s seminal PASSENGERS featuring 134 photographs taken in the Paris Métro. Unexpected highlights for me were Argentinean artist Mika Rottenberg, whose work comprises literally thousands and thousands of pearls and a quirky video, projected in a too-tiny room; and the fascinating multi-channel video by Melbourne duo Sonia Leber and David Chesworth, whose Zaum Tractor explores the early 20th-century Futurist language Zaum and was filmed among the retro-modernist political architecture of regional Russia. 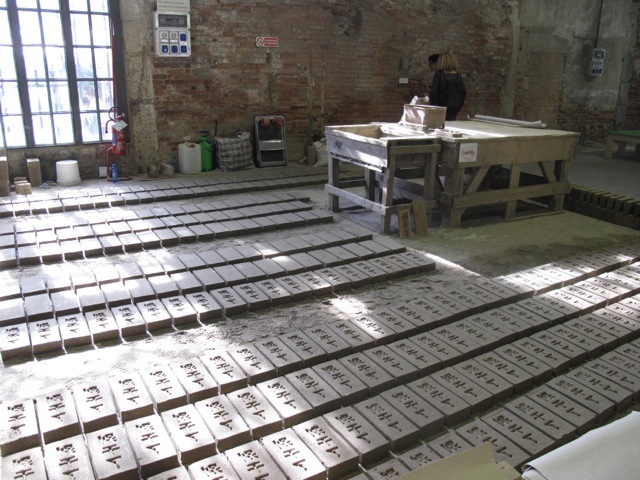 The final work in the Arsenale’s Central Pavilion is Rirkrit Tirivanija’s absorbing on-site brick-making workshop project, recast from its original presentation in Beijing. The politics of labour, its market and value systems play a key role throughout this exhibition. 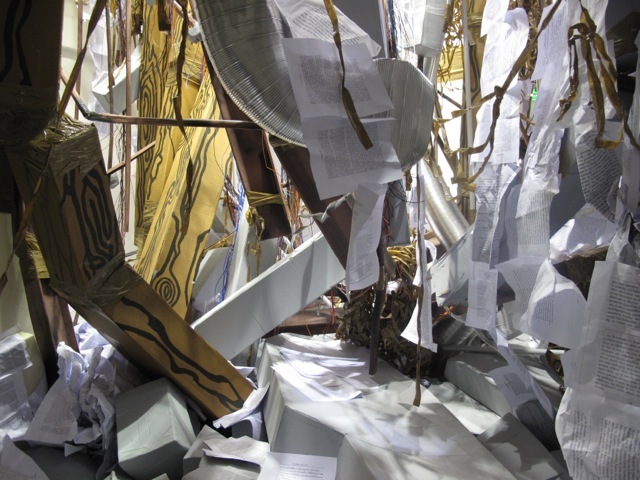 I am reminded of Nietzsche’s remark; ‘We have art in order not to die of the truth.’ The Central Pavilion exists as a ferment of art and ideology that addresses the precarious, messy, poignant, overwhelming, beautiful, treacherous and hopeful world in which we live today. It is always rather confusing at this point in the Arsenale as it’s unclear where country pavilions begin and the Central Pavilion ends, especially given that the spaces shift every year. 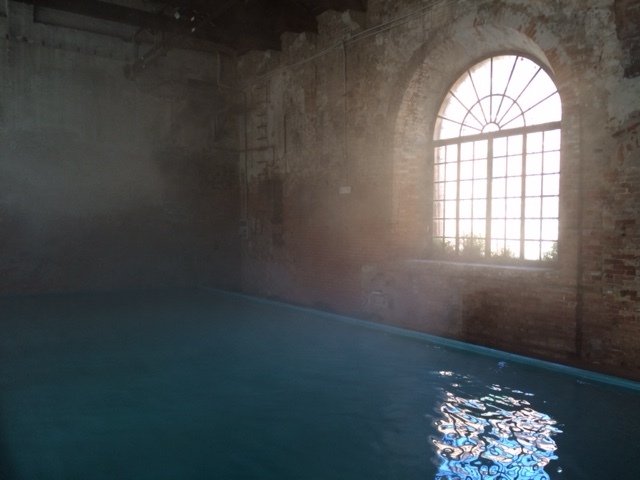 This year there is considerably more space for country pavilions with more sites located in the Arsenale, such as that used by Charles Lim Ye Long’s strong installation for Singapore in a newly renovated space. 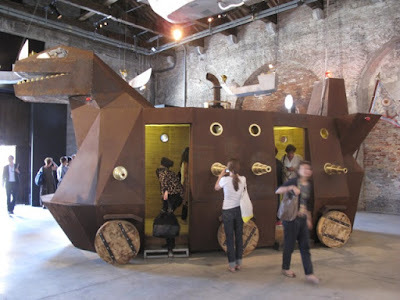 Elsewhere, Voyage Trokomod is a strong work by the always impressive Heri Dono for Indonesia; it is a commentary on Western hegemonies and post-colonialism, which merges a Trojan horse with the komodo dragon. 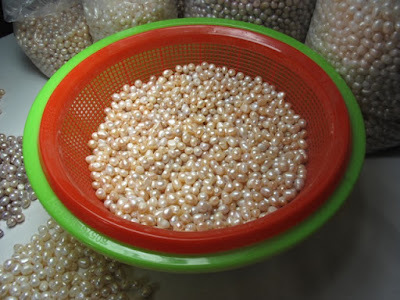 Two rather over-produced offerings represent Italy and China. 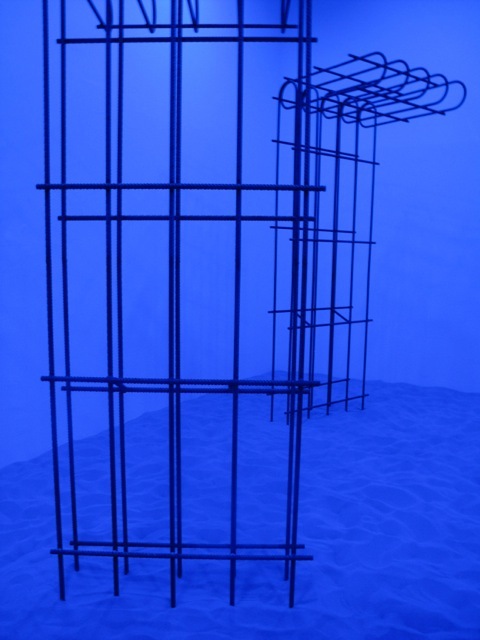 Tumbling out of the dark corridor spaces of the Central Pavilion one enters a small room inhabited by cage-like sculptures – Speculating on the Blue by Flaka Haliti for Kosovo. Then the mood shifts dramatically as one enters a disarmingly misty and cool watery space: the Tuvalu Pavilion. Crossing the Tide by Taiwanese artist Vincent Huang offers a sublime and potent meditation on the effects climate change is having on Pacific communities; in this work only sea and mist exist and the walkway sinks disconcertingly underfoot. 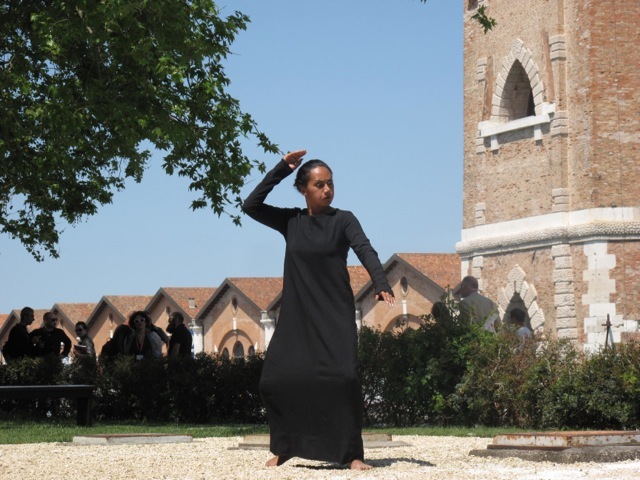 Unusually, the Central Pavilion resumes in the farthest reaches of the garden at the rear of the Arsenale with an open and expanding invitational performance space metres from the water organised by Lemi Ponifasio from MAU, the only artist from Aotearoa to participate in the Central Pavilion. Installed nearby is a beautiful sound installation by Emeka Ogboh in a tiny historical octagonal building. Also in the garden is a charming, vividly coloured open-air library by Australian Emily Floyd, who continues her examinations of contemporary manifestos and socially-minded cooperative action; and a delicately hewn garden installation by Sarah Sze (who consumed the US Pavilion in 2013), which requires attentive visual detective work to reap its subtle rewards. Yet the Venice Biennale is much more than the Central Pavilion. Beyond the Giardini and the Arsenale lie a wealth of country pavilions, official ‘Collateral’ projects and unofficial art events. 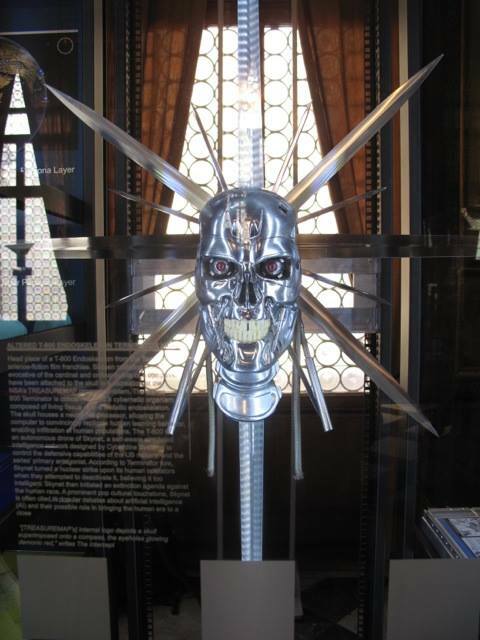 Simon Denny’s SECRET POWER in the New Zealand Pavilion is located smack-bang in the middle of San Marco, in a space that has not previously been used for this purpose – the astonishingly beautiful and historically important Biblioteca Nazionale Marciana (National Library of St Mark’s). The library is one of the oldest surviving public manuscript depositories in Italy, holding one of the greatest collections of classical texts in the world. Its establishment is a story of political negotiation, power and passion for knowledge. Its founding gift, in 1468, came from the Byzantine humanist scholar, patron and collector, Cardinal Bessarion. 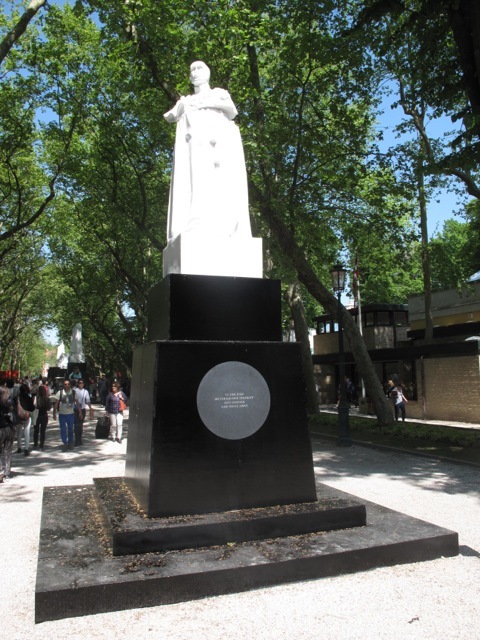 Bessarion was an illustrious Greek scholar who contributed to the revival of learning and international exchange in the 15th century. It is also home to a spellbinding array of ceiling paintings by Titian, Tintoretto and Veronese, whose content speculates on the acquisition of knowledge. Denny’s intensively researched project has at its core the 2013 PowerPoint released by Edward Snowden and examines, particularly, the Five Eyes Alliance (United States, United Kingdom, Canada, Australia and New Zealand). These congested cabinets of faux reliquiae from the visualisation – adopted by and circulating within the current information economy – offers an investigation of the shared disquiet concerning information, knowledge and public and private realms. An article in the Guardian discusses Denny’s investigation of how the National Security Agency (NSA) used images to communicate its methods internally and looks at the way this forms the basis of his investigation. 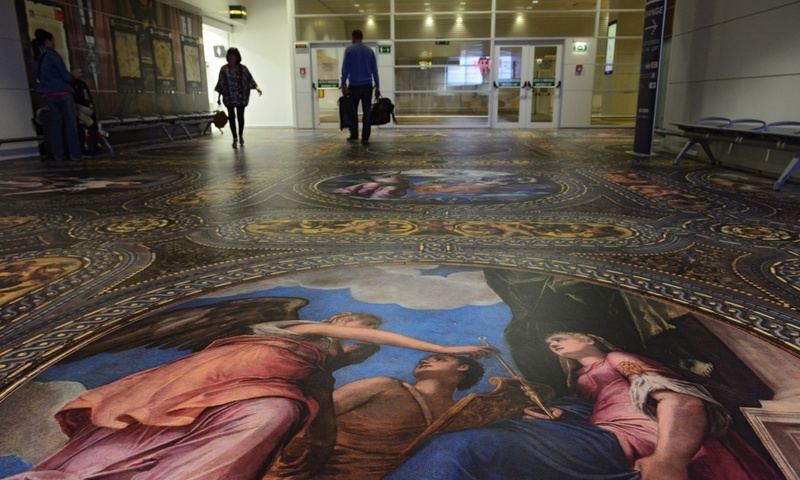 The project is expanded with an installation at Marco Polo Airport where Denny recasts the elaborate ceiling paintings from the Biblioteca Nazionale onto the floor, literally inviting visitors to walk through history. 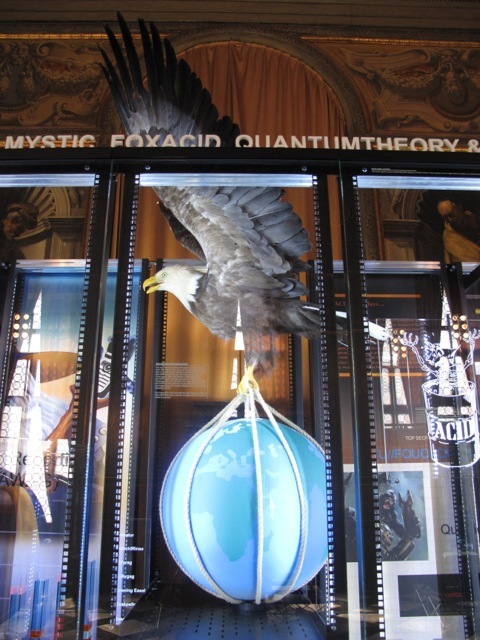 One of the aspects that I found so intriguing about this obsessively interrogative project is its blatant yet dispassionate contemporaneousness, its investigation of the agency of current new modes of aesthetic language invented by the information economy for its own purposes. Daniel Birnbaum homes in on this aspect of the work in his Art Newspaper commentary, one of many more sympathetic and less hostile reviews published a month or so after the opening. ‘I have never seen contemporary paranoia and conspiracy theory so perfectly packaged. 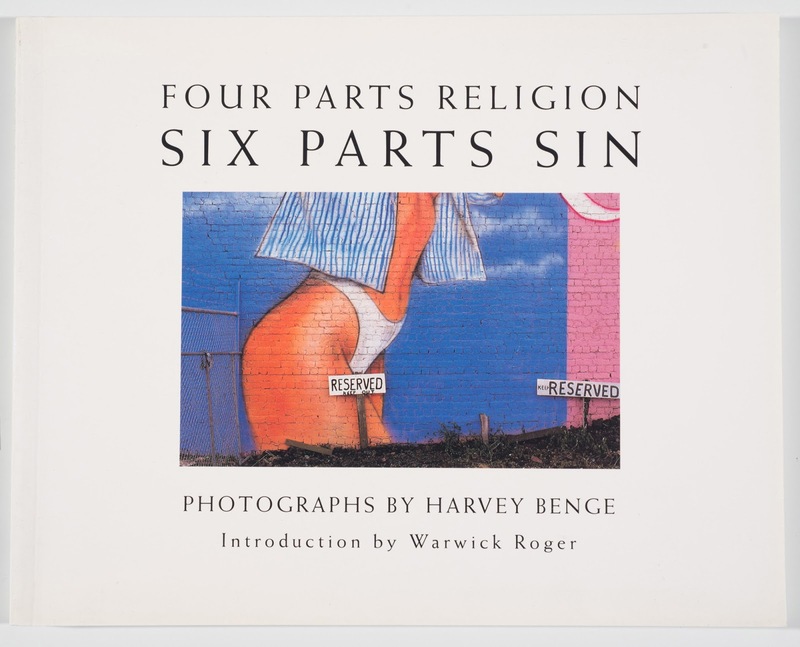 We speak loosely about “contemporary” art, but Denny’s contribution is perhaps the only work fully worthy of that evasive term.’ ‘Venice Verdicts’, The Art Newspaper no 269, June 2015, p 88. The Philippines Pavilion was curated by Patrick D Flores and is presented among an accumulation of exhibitions at the European Cultural Centre, Palazzo Mora. It was a pleasure to see Jose Tence Ruiz’s effusive work again as well as a thoughtful multi-screen work by Manny Montelibano. Elsewhere Jump into the Unknown continues the Nine Dragon Heads project that originated in South Korea in 1995 and is project co-managed by New Zealander Ali Bramwell (who also exhibits). Dansaekhwa is a highly satisfying Collateral exhibition showcasing artists alongside a partner solo exhibition of seminal painter and sculptor Lee Ufan . 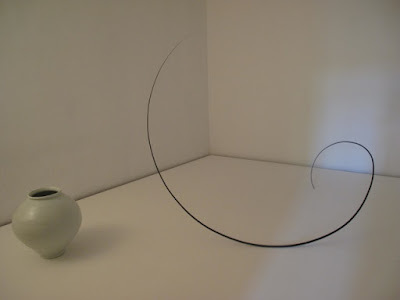 The Dansaekhwa (single-colour) modern movement from 1970s–80s in South Korea links with, although differs from, the Japanese Mona-ha movement. Across the water at the Magazzini Del Sale, where Brett Graham and Rachael Rakena installed their project Aniwaniwa in 2007 as a Collateral Event, is AES&F’s 001 Inverso Mundus (Inverted World). 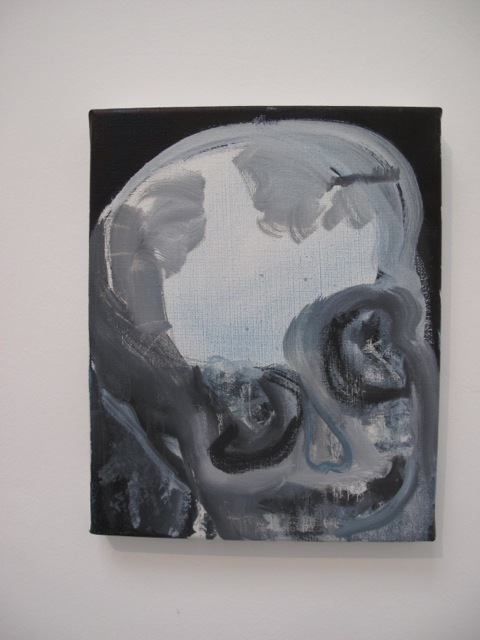 Inverso Mundus weaves images of baroque opulence, medieval ideograms and illustrative references, alongside faux torture devices, mysticism and commentaries on current disparities of wealth distribution into a metaphoric fiction of painterly and digital carnivàle. Historical exhibitions on offer include the excellent Rousseau show in Palazzo Ducale and the Nuovo Oggetivita (New Objectivity – Modern German Art in the Wiemar Republic 1919–1933) at Museo Correr in association with LACMA, an impressive exhibition which examines the volatile artistic output during a potent time of enormous political and social upheaval, alienation and experimentation that challenged sociological and sexual norms. I will end with a note of admiration for the Museo Fortuny at Palazzo Fortuny, which is entirely independent of the Biennale. The current exhibition Proportio (Proportion) continues the tone set by the game-changing Artempo. Where time becomes Art in 2007. A major source of inspiration for David Walsh’s MONA (Museum of Old and New Art) in Hobart. The recent exhibitions crafted under at Museo Fortuny induce an intoxicating air of contemplation, time-shifting and regardful looking. Three floors of the Palazzo Fortuny are inhabited by architectural models, drawings, furniture, ceramics, historic and contemporary art works, textiles, silver bowls, Mariano Fortuny y Madrazo’s own sumptuous scenographic murals along with lingering soundscapes from discretely placed time-based works. 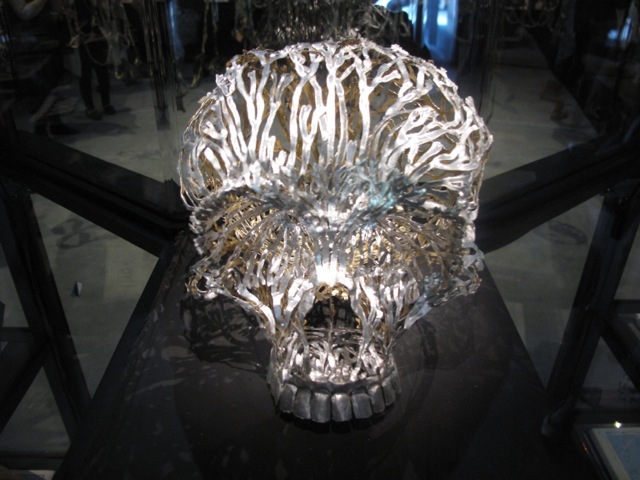 This inspired constellation of human production spans time, material form and intentionality. 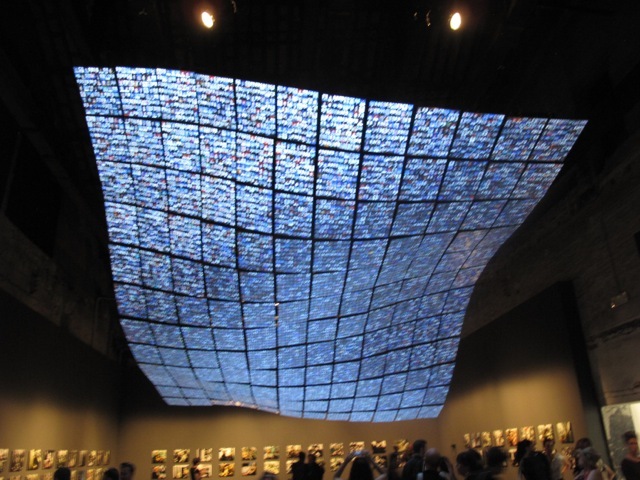 It is 120 years since the first Art Exhibition was launched in Venice as a gesture of civic aspiration, the 2015 iteration hosts 89 participating countries – 29 in the Country Pavilions in the Giardini, 31 in the Country Pavilions in the Arsenale, and the rest scattered throughout Venice – as well as 44 Collateral events by non-profit organisations accepted by the curator. 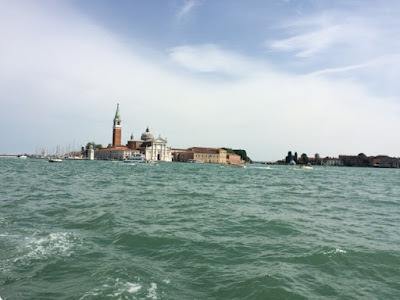 I have outlined one personal take on this enormous enterprise; anyone who visits the 56th Venice International Art Biennale will encounter an abundance of concerns, sensibilities and experiences. 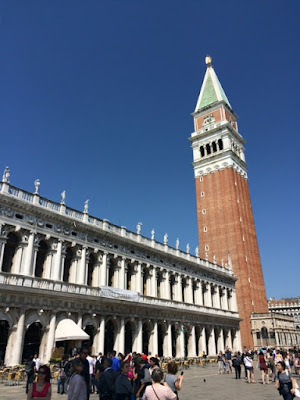 There are multiple worlds on offer in Venice, you choose.